The Chabad Center of Sudbury invites you to join us as we celebrate the Grand Opening of the new Chabad Center of Sudbury. Just over eleven years since Chabad of Sudbury was established and a little over three years of working on the current Building project, we are finally ready to celebrate and we would love you to join us for this historic occasion. 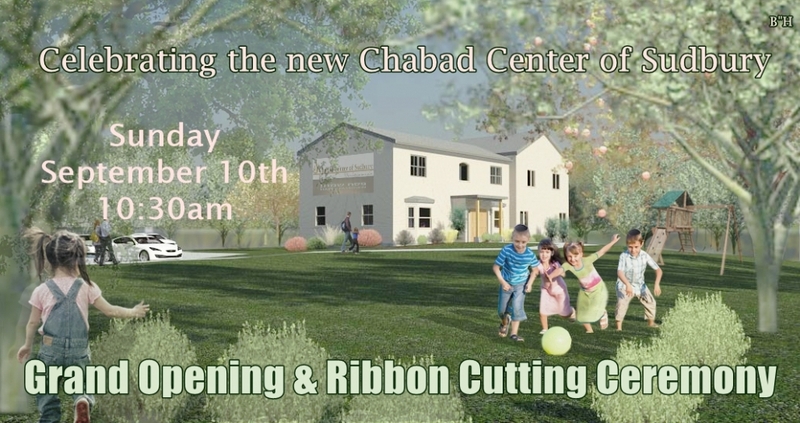 Join us for the Grand Opening and Ribbon Cutting Ceremony on Sunday September 10th and celebrate the beautiful new home of the community and the flourishing Jewish life that it will contain. For Sponsorship & Dedication Opportunities please click here. While the project is almost complete, we still have lots more to do. You can help us finish it off and be a part of Jewish growth and life in the Sudbury area by supporting our Building Campaign in this link. Furnishing List - Additionally we are looking to furnish the new building and if you would like to help with any of the items below to help us finish the project or furnish and supply the building, please let us know in the comments. Amazon Gift List for the new Building - Some of the items which we need for the new center we have listed on an Amazon list over here. If you click and pay for the item they will be shipped directly to us and we will issue a Tax Receipt. Please charge to my card.